Our grey two-channel monster starts with classic British-inspired, crunching rhythm tones in Gain I mode. Gain II sears on into tight, aggressive American high-gain grind, perfect for progressive and extended-range players. 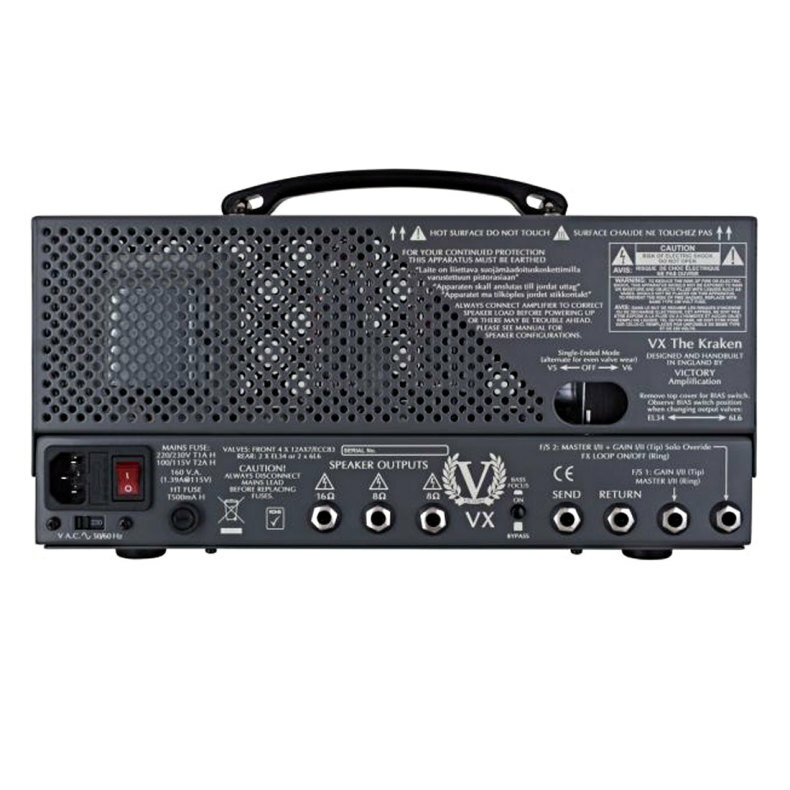 It may be a small box, but VX The Kraken is packing a versatile 50-watt power section that you can use at home, in the studio or on the biggest stages. It'll even travel as hand luggage when you fly! 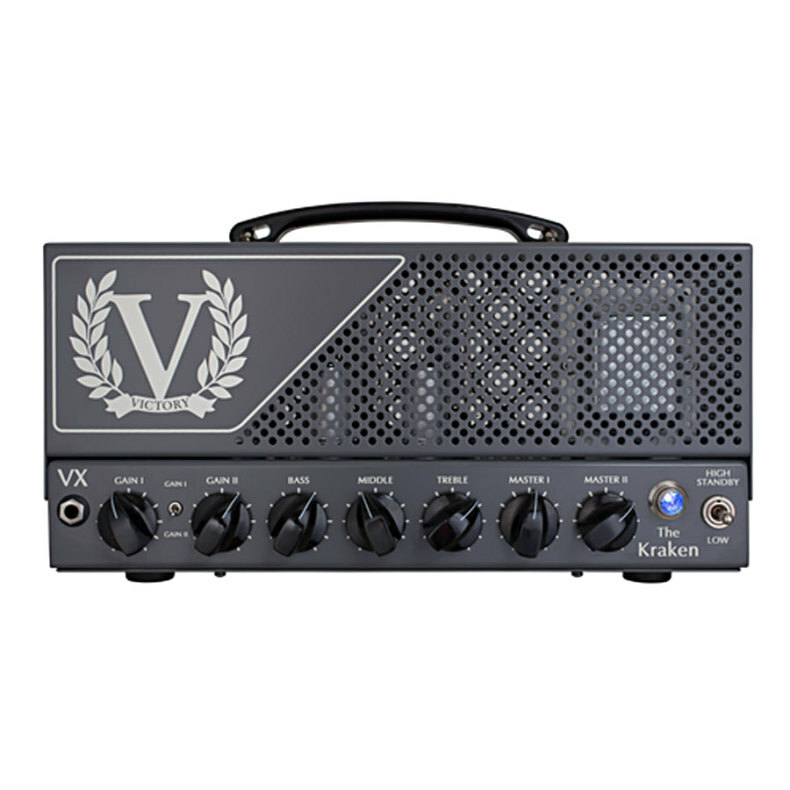 One for the gain addicts, VX The Kraken pushes all the boundaries of what you can expect from a 'small' amp. The Kraken can be fitted with either 6L6 or EL34 output tubes - it’s simple to switch the output valves in this amp, although for optimum performance & valve life you should get an amp engineer to re-bias the amp every time you change the output valves. In the original tone testing of the Kraken (that included Martin Kidd & Rabea Massaad) it was agreed that 6L6s gave the tone we were looking for, & so the “regular” Kraken comes with these valves fitted as standard. However, if you think you’d prefer the Kraken fitted with EL34s you can order that as standard if you want. It should be noted that in Rabeas stereo Kraken set up (which is without doubt the most crushing guitar tone we’ve ever heard!) he uses EL34s in the amp he sets to channel 1 & 6L6s in the amp he sets to channel 2. Similar to it's more refined sibling the Countess the Kraken is a portable, 2 channel head but you wont find a subtle clean channel here. Instead the Kraken presents you with 2 gain channels, 1 based on British tones and the other on American sounds. If you like your metal heavy this amp is for you. While a lot of amplifiers will offer you a clean and crunch channels very few offer you just two high gain crunchy overdrive channels. If you play rock or metal the clean channel may be completely useless to you so why not replace that with another gain stage so you can free up your pedalboard of all of those pesky drive pedals. 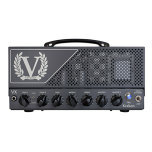 This version of the Victory VX comes as standard with a set of 6L6 power amp tubes. You are not stuck with these for life though as you can easily change out the 6L6 tubes for EL34 at any time as long as you bias the amp after changing over. The differences between these tubes are subtle but noticeable in the feel to the player. If you would rather get a version pre configured for EL34 valves click here. 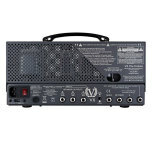 50w is a lot of power but it is often needed at medium to larger size venues to even be heard when mic'ed up. When you are at home however that can just be overkill. Victory know that you don't always need 50w so you can switch the Kraken down to 15w, 9w or even 2w of power for use at home, in the studio or on smaller stages. So many artists that play prog metal, djent or similar genres are using extended range guitars. Whether that is 7, 8 or even 9 strings the Kraken has a trick up its sleeve to make sure you never get flabby low end again. With a flip of the Bass Focus knob you go from a tight and focused low end that works great with extra low tunings to a looser lower end perfect for grungy American metal tones. 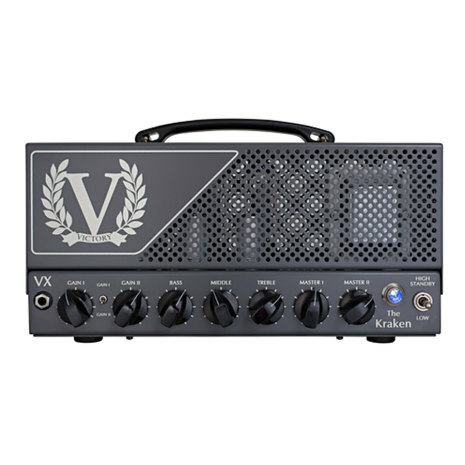 "For the VX to pack such a powerful punch from such a small package makes it one of, if not the best metal amp we have ever played through." "To all extended range players: Consider yourself well and truly catered for. Unleash The Kraken, indeed!" "6L6 - The 6L6 Loaded Kraken has a little more warmth in the low end, and has a slightly smoother/sweeter top end which is great for singing leads. The mid range is barky and aggressive with a powerful punch. This configuration lends itself to anything between warm, pushed clean/crunch tones, through to powerful and chunky rhythm tones. EL34 - The EL34 Loaded Kraken has a powerful and cutting mid and high range, with a controlled low end. Gain 1 gives you a classic British crunch to enjoyable high gain tones, whereas gain 2 gives you soaring lead tones, a biting mid range and a solid low end. The difference is pretty subtle but does make all the difference in feel to the player."